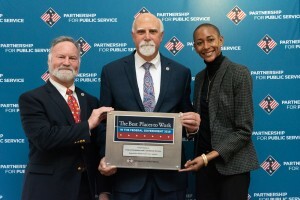 WASHINGTON, D.C. – The U.S. Federal Mediation and Conciliation Service (FMCS) again received the top ranking among small Federal agencies as a Best Place to Work in the Federal Government, according to the 2018 rankings released today by the nonprofit Partnership for Public Service and Boston Consulting Group. With rankings first being held in 2003, this marks the fifth time FMCS was selected for the top spot, having earned this distinction in 2005, 2007, 2015, and in 2017. Additionally, the Agency has consistently ranked in the top 4 since the “small agency” category rankings were first included in 2007. Data points from the FEVS revealed that FMCS’s 2018 employee engagement score is 87.2 out of 100, which placed FMCS at 1 out of 29 small agencies. The FMCS score improved by 0.3 points since last year, while the government-wide engagement score is 62.2, down 0.6 points from last year. Looking forward to the 2019 FEVS, FMCS will maintain its focus on continuous improvement and has already begun work to increase innovation, one of two categories where scores declined slightly from the previous year. The nonprofit Partnership for Public Service, and Boston Consulting Group, which released the rankings of Federal workplaces today, based their overall ratings on responses from more than 598,000 civil servants to the Federal Employee Viewpoint Survey (FEVS) conducted by the U.S. Office of Personnel Management (OPM) annually. Historically, there have been between 28 and 35 agencies in the “small agency” category for Federal government rankings. The Best Places to Work rankings provide critical information to help Federal agencies and Congress assess workplace health and performance. In addition to overall satisfaction and commitment, the rankings measure employee attitudes on multiple workplace categories, including effective leadership, strategic management, innovation, support for diversity, training and development, work-life balance, teamwork and pay.